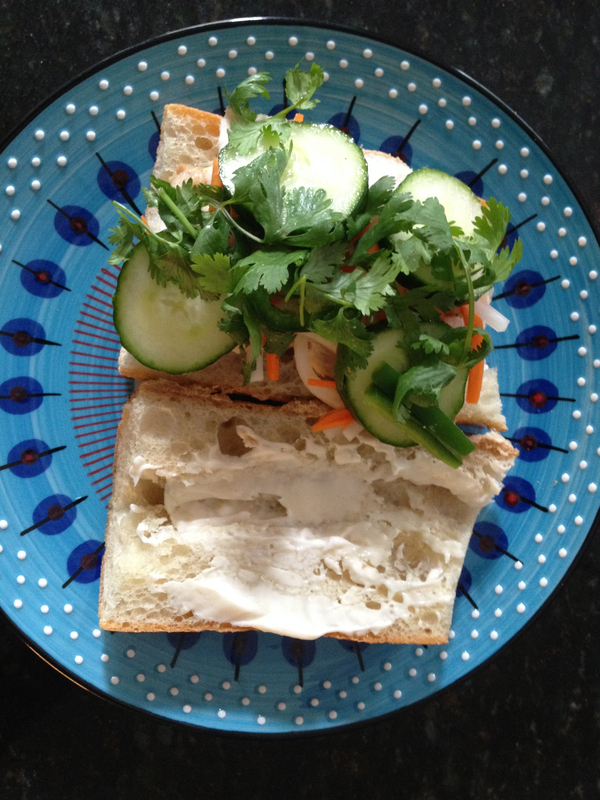 This is a sandwich, a banh mi sandwich, made by Chip, the dude of chickdudefood. It’s not even the sandwich at the heart of this story, but that one was too delicious to take a picture of. It started like this: Chip makes an incredible, and I mean out-of-this-world BLT. It’s so amazing, and his process for making it so precise, that I wrote a poem about it…that won’t be shared here. I’ve seen him take 45 minutes to get this sandwich to a place that he deems mouth-ready. It involves getting a lot of things exactly right: the kind of bread and how it’s toasted, the amount of mayo, the seitan bacon layered just so, the peeled tomato sliced a certain way, the placement of the must-be-Boston-or-butter lettuce, the salt, the pepper, the final pinch of a secret ingredient that maybe he’ll write about some day. Anyway, this sandwich usually gets constructed late at night when Chip gets home from work. The smells that come up from the kitchen will wake me from a sound sleep and propel me downstairs in my pjs, with pillow hair and sleepy eyes, just for the chance of a taste, or just to watch something so beautiful get made and consumed. (I know, I’m a little strange about food.) There’s been deep analysis of what makes this sandwich so great, and he thinks he knows, but again, that’s his recipe to share. About a month ago, maybe a little more, Chip made this BLT at an actual mealtime. For himself. In every possible way I could think of, I took a sidelong approach—to see if I could get him to make one for me. I tried everything, that is, except simply asking for one. He finally turned to me, while he was peeling the tomato, and asked me if I wanted one. You know the answer. Here’s how this ties in to the “Life” part of this blog. If I can’t ask for a sandwich, how can I ask for help? And if I can’t ask for help, how can I be fully in recovery? Because the truth is, I can’t do this alone. I do need help. We talk a lot, my friends and I, about how hard it is to ask for help. For me, whose identity was for so long completely dependent on being perceived as strong, as self-reliant and self-sufficient, as perfect as I could be, it’s nearly impossible. My response to difficult emotions or stress or whatever has, in the past, been to isolate myself, pull the covers over my head, and drink or take something until I felt I could face the world again. Sometimes that took hours—sometimes days or weeks or months—and, by the end, I was pretty much silent, alone, miserable, and desperate. It takes courage and practice—to raise my hand at meetings and at home, to share the sorrows and puzzles of my life along with the joys—stories of gratitude are easier to tell. I’m getting a little better at this, slowly, and with the support of my community. I’m slightly more likely to be able to ask for help as freely as I give it. (Giving? That’s simple.) I’m trying to give up the facade of strength and self-sufficiency and perfection, because they are destructive and unattainable. I’m allowing myself to be a mess, when I’m a mess. And it turns out that I’m surrounded by people who also struggle to ask for help, but who show me how to do it and that it’s safe and that help will be freely given to me. So last night when Chip said there was probably one more garden tomato to be turned into an October BLT, I said, “Will you make one for me, too?” Straight out, direct, face to face, with eye contact. And so I will get what I want—my reward for asking—an out-of-this-world BLT that is, for me, more than just a sandwich.